NEW! Heated Full Downdraft Booth. 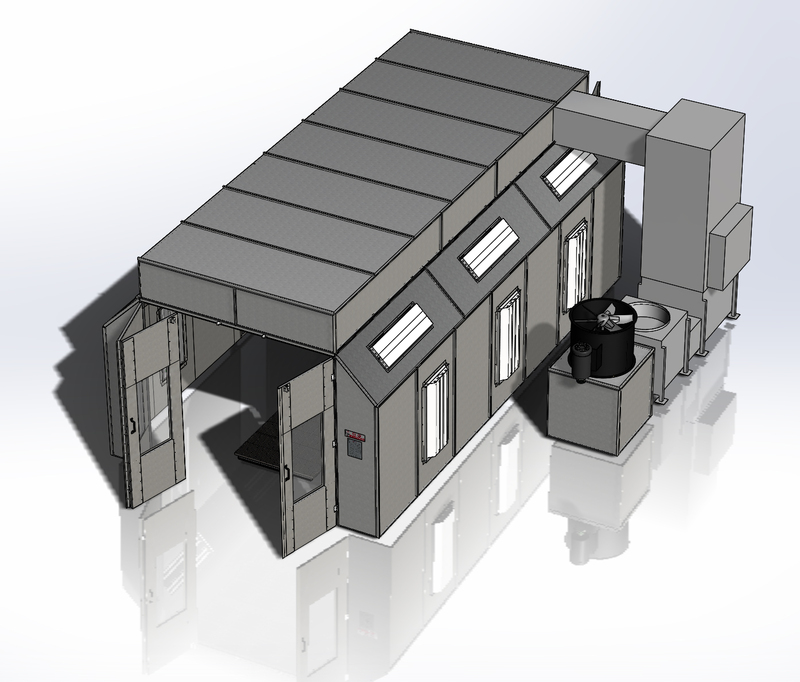 We have designed a heated downdraft full-sized paint booth. 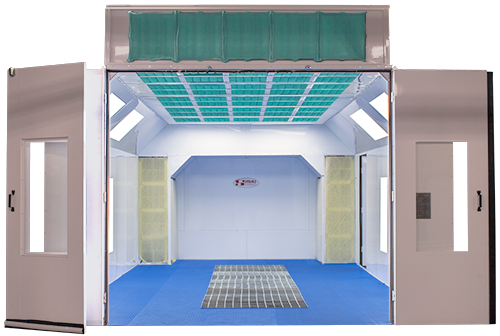 The downdraft paint booth supplies filtered air to the booth through the full-filtered ceiling, and exhaust the chemical-containing air through filters below the grating on the floor. The air is directed downward, and the paint vapors and overspray are carried downward. So, the toxins do not pass by the painter’s breathing zone. This design is built for a pitted exhaust system. Although we provide the grating and the floor filters, we do not include the installation of the actual pit. Since this booth is heated, the intake air is passes over the Sure-Cure direct-fired air make up unit (AMU) before it is pushed down through a full-plenum filtered ceiling. Booth Shown: DD-1000GH, with Powder-Coating finish, LED Flat Panel Lights, Floor covering. We provide the booth, the Sure-Cure air makeup unit, the floor grates and filters for your downdraft paint booth. We are the manufacturer and can customize your booth to fit your needs. So, if you want to add lights, have double drive-thru doors or make your booth taller, just give us a call for a custom-designed booth. Variable Frequency Drive (VFD) is an electronic motor starter that controls the speed of the exhaust fan with the turn of a knob. You have more accurate control over the airflow inside the booth. As always, it’s important to do your research before buying your booth. Have you thought about these Top 10 Things? What are the inside depth of the pit required for this unit? 20′ x 4′ x ? Yes, 20′ X 4′ is the recommendation… the user determines the pit size. Sorry for the delay… yes, we sell into Canada. We have been building booths for over 20 years and have over 20,000 booths in the field. We have plenty of customer’s who we can send you to for a review. We are the manufacturer of both the booth and the air makeup unit, hand-built right here in NC. We would love to provide anything you need… just give us a call at 888-312-7488. Previous Previous post: Industrial Spark-Proof Room (ISPR) from Standard Tools and Equipment Co.